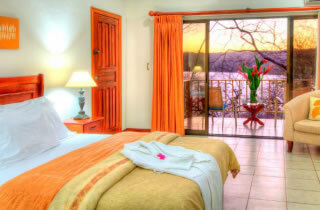 Vista Bahia Beach Resort is a 33 room facility with very large spacious rooms built four years ago as a condo-hotel. 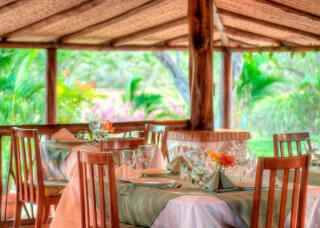 The resort’s attributes that differentiate the property is their nature and site characteristics. The resort’s name is derived from the slightly elevated peninsula which hosts a spectacular lookout site into the bay’s calm waters. The view is impressive and more so because the site developers kept the natural forests and landscape which support a troop of howler monkeys and other wildlife and birds. 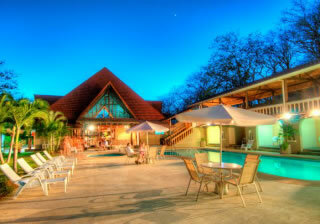 The resort’s lobby, restaurant, bar, and pool are located within a building we call the Palenque. 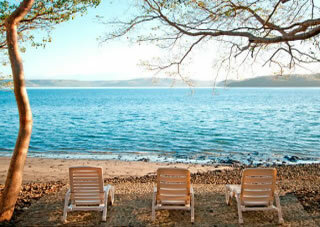 The building was stylized by Jeff Laufel the original developer as a communal fishing center since the resort’s peninsula was originally used by indigenous people for fishing. The hand hewn wood columns and stone sculptures are unique. This building acts as the central hub to the resort activities but is located at the lower end of the resort property, away from the rooms which are accessed by a short 50 meter road. Guests are transported to their rooms on electric carts or on walking trails so that the rooms are not disturbed by vehicular traffic. Whether it’s lounging in the sun or wading in the water, the pool provides a getaway unto itself. The pool is conveniently located by the main lobby and it’s next to the restaurant where you can be served a refreshing beverage.